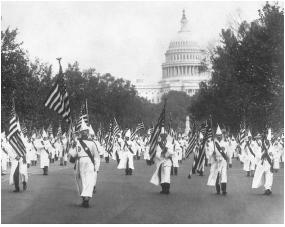 Ku Klux Klan members parade in Washington, D.C., during the 1920s, a decade in which Klan membership grew into the millions and the group exerted significant political influence. Also in 1871, President ulysses s. grant relocated troops from the Indian wars on the western plains to South Carolina, in order to quell Klan violence. In October and November of that year, the federal Circuit Court for the District of South Carolina held a series of trials of KKK members suspected of having engaged in criminal conspiracies, but the trials resulted in few convictions.The Klan declined in influence as the 1870s wore on. Arrests, combined with the return of southern whites to political dominance in the South, diminished its activity and influence. The KKK experienced another, less successful resurgence during the 1960s as African Americans won civil rights gains in the South. Opposed to the Civil Rights Movement and its attempt to end racial Segregation and discrimination, the Klan capitalized on the fears of whites, to grow to a membership of about 20,000. It portrayed the civil rights movement as a Communist, Jewish conspiracy, and it engaged in terrorist acts designed to frustrate and intimidate the movement's members. KKK adherents were responsible for acts such as the 1963 bombing of the Sixteenth Street Baptist Church in Birmingham, Alabama, in which four young African–American girls were killed and many others injured, and the 1964 murder of civil rights workers Michael Schwerner, Andrew Goodman, and James Chaney, in Mississippi. The Klan was also responsible for many other beatings, murders, and bombings, including attacks on the Freedom Riders, who sought to integrate interstate buses. In many instances, the Federal Bureau of Investigation (FBI), then under the control of J. EDGAR HOOVER, had intelligence that would have led to the prevention of Klan violence or conviction of its perpetrators. However, the FBI did little to oppose the Klan during the height of the civil rights movement.